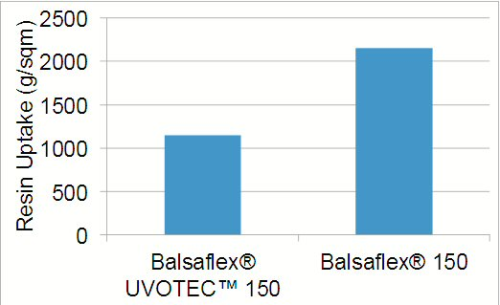 Gurit says the UVOTEC coating technology for its Balsaflex balsa core materials significantly reduces the quantity of resin absorbed during processing, without compromising adhesion to the laminate. The Balsaflex UVOTEC technology can be used in hand lay-up, vacuum bag and infusion processes.As Dr Damian Bannister, Gurit’s Chief Technology Officer, explains, balsa wood contains a number of vessels and cells, some of which go all the way through the wood. This means a balsa panel can absorb 2 kg plus of resin per side, per square metre. So Gurit looked at ways of sealing the balsa surface, while adding as little weight as possible.Bannister reports that with the UVOTEC coating a reduction in resin absorption of roughly 1-1.3 kg/m2 is being seen.This was proven in tests on a sandwich laminate constructed with two plies of 1200 g/m2 triaxial glass each side of a Balsaflex 150 core, with and without UVOTEC coating, infused with Gurit’s PRIME 20 LV epoxy infusion resin to achieve 35% resin content laminates. This reduction in resin absorption reduces the weight of the panel, and reduces the amount of resin used, resulting in cost savings. “The other problem you have when you seal products is that you can reduce the mechanical bond with the laminate,” notes Bannister, “so the target here was to have a product that still had very good peel strength to the laminate.”Gurit performed numerous adhesion tests which demonstrated no detriment to the adhesion strength of UVOTEC-coated balsa. One application for the UVOTEC-coated balsa is wind energy. “A lot more of the wind blades now are getting more weight critical, so obviously saving a kilo per square metre’s beneficial, but also you save however much you’re paying for your resin as well,” notes Bannister. Balsaflex balsa core material is also used in marine, automotive, truck, rail and aircraft parts.The UVOTEC coating is currently available on plain sheet.